Introducing three new books from Building To Teach, a leading advocate for math learning through hands-on instruction! Since 2015, a sample of 1,000 students shows an average increase of 25.5% in measured math skills for students participating in Building To Teach activities, like the ones presented in these books. Stay after school for math tutoring or help build a boat? Twelve-year-old Emma chooses to help build a boat. Helping Bill, a family friend, put together a simple skiff, math becomes useful and “not so hard.” And, the building is fun. This story introduces the boat building process and complements both the boat building and the related math instruction. Parents and teachers will love how this book introduces kids to the application of math, and kids will enjoy the illustrations and fun story. 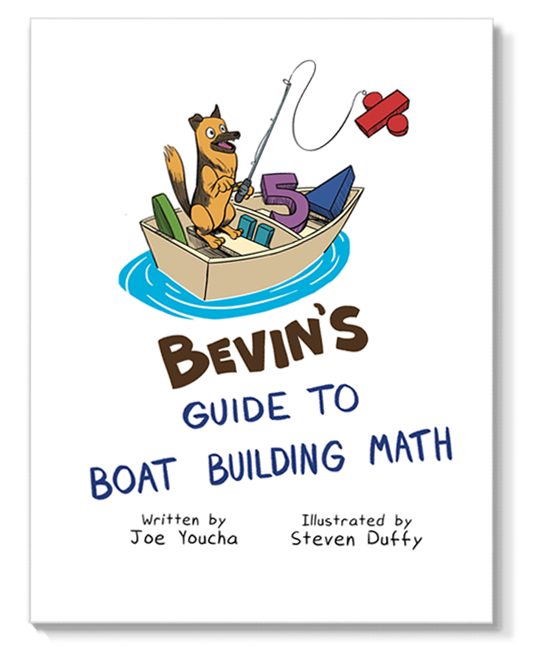 This book is designed to be used with Bevin’s Guide to Boat Building Math (below). Building a boat is building a future. Investing in kids and boats can change the world. In Afternoons in the Boatshop, Joe Youcha invests kids with the power and confidence to change their future by building a boat. His thoughtful descriptions, clear illustrations and the references to “Bevin’s Guide to Boat Building Math” combine to produce an excellent little book. Having seen in action the math skills delivered in a fun and exciting way in building the Bevin’s Skiff, I look forward to adding yet another dimension to the project to help students develop and improve literacy. All while building a boat—how cool is that?! Anyone who has built a boat knows that it is the near perfect vehicle for teaching applied math and science where these skills are used, every job, every hour, every day. Afternoons in the Boatshop is just the ticket for any young aspiring boat builder, instructor or anyone who just wants to know why people love building boats. A shop dog who’s seen hundreds of boats built, “Bevin” presents math as a building tool. Based around building a cardstock scale model of Bevin’s Skiff (patterns included), this book ties to its companion book, Afternoons in the Boatshop, where Emma and Bill build a full-sized version of the boat. The projects and exercises in this book focus on the skills of organization, numbers sense, mental math, and fractions, as well as understanding the application of the math. These skills lead to success in using math, whether it’s in the shop,in a classroom, or in everyday life. 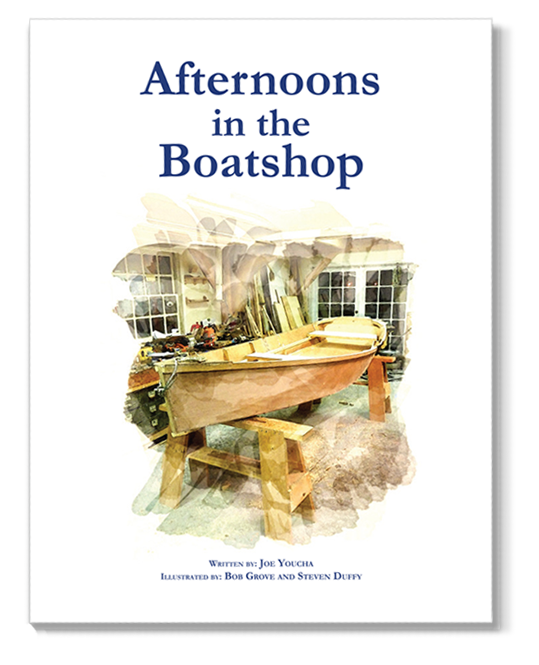 This book is designed to be used with Afternoons in The Boatshop (above). Despite being an engineer, math never came easy for me...I'm convinced that the absence of anything immediate and useful to apply it to just took the punch right out of it. Trying to build a boat that is both useful and immediate should spark things up, giving kids genuine problems that only mathematics can solve. The Bevin's Guide to Boat Building Math is an excellent resource for both students and staff. It has enhanced the building process through clear explanation of the applied math. I don't know how I would teach without it! If you were to buy one tool to teach and demonstrate hands-on math, it should be a framing square. Along with over 50 hands-on exercises that show how math is useful, this book also includes some history and a hands-on math glossary. This is visual math, math described as ratios and proportions expressed through similar triangles. Sixty-five percent of students in America are visual learners. Why don’t we teach for them? NOTE: There are two corrections to the Framing Square Math book for editions printed prior to February 10, 2018. They correct errors in the Parallel Lines problem on page 67 and the Trigonometric Table on page 71. You can download a correction sheet here. Framing Square Math helps my students make sense of the pencil and paper math they have been struggling with in traditional math class. I can't count the number of students who, after finally comprehending a challenging concept, asked me why everyone didn't teach math this way. 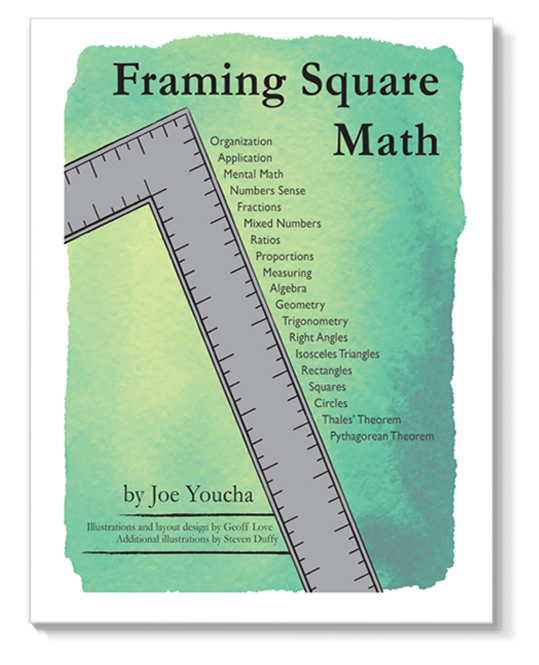 In this workbook, Joe Youcha has accomplished what a schoolbus-load of textbooks often fail to do: Provide the visceral experience of math coming to our senses through the good work of our hands. For many of us, there is no better way to find success with numbers.